This recipe for vegan gluten-free Lasagna, utilizing slices of zucchini in place of pasta, was created in the heat of summer when my son would bring home bushel baskets of zucchini. It became a household favorite, offering a healthier and lighter alternative to pasta and it is a meal we enjoy hot or cold. I use commercially prepared pasta sauce most often because of convenience. If you don’t make your own, be sure to check the ingredients to make sure you are not eating things you don’t want, like high-fructose corn syrup or too much sugar or sodium. I also use a 1lb bag of frozen chopped spinach, thawed. Baby spinach would be a wonderful choice, but in my house that is readily consumed in salads and smoothies. I keep frozen spinach (and broccoli) on hand all the time, so I’m always confident it will be there. You may be thinking: “doesn’t the zucchini just fall apart“? Well, the short answer is “no, it is a nice soft layer and makes the lasagna wonderfully moist. (Full disclosure: occasionally we will make this recipe with a 50/50 mix of pasta and zucchini. Its just as yummy, but will be a little more familiar to the traditionalists in your family.) Making thin, and consistent, slices of the zucchini takes a little practice, to be certain, but a good sharp knife, and a steady hand makes it work. You can use the entire vegetable, too, including the sides that will be mostly skin – just layer it all in there. Delicious Vegan Gluten Free Lasagne Ready to Eat! Combine ricotta, spinach and 1 tbs oregano. 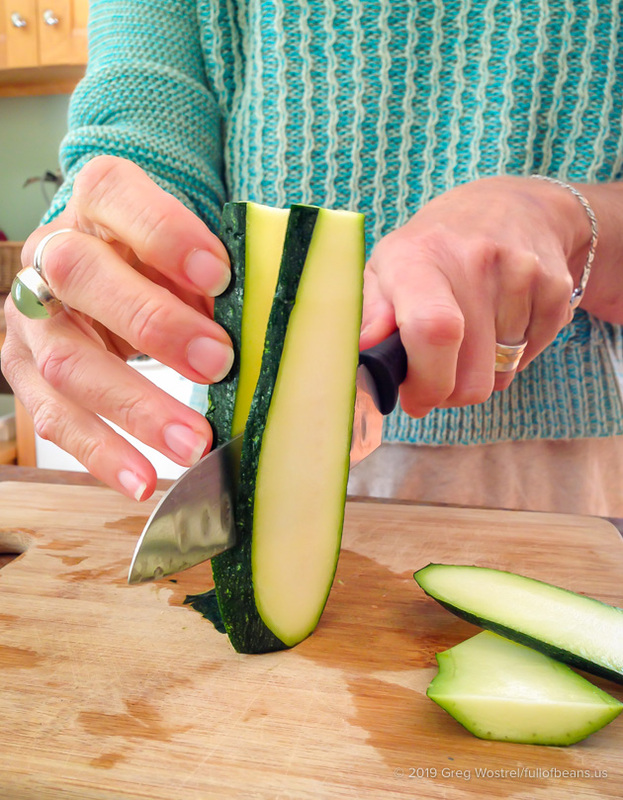 Slice zucchini into vertical slices, 1/8 to 1/4 inch thick. Cover bottom of 9×13 with 1 1/4 cup of sauce. 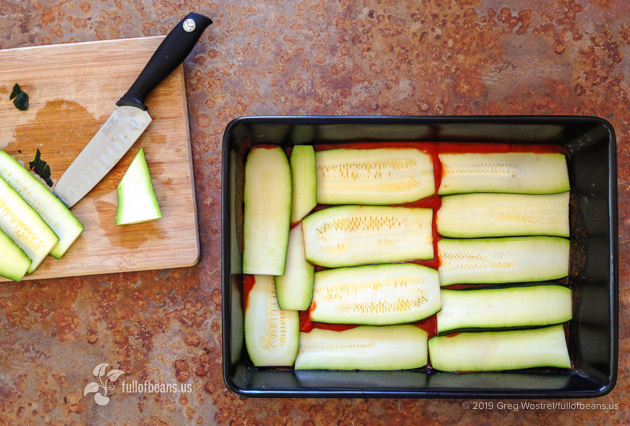 Layer slices of zucchini on top of sauce. Cover with half of the ricotta sauce. Top with a layer of sauce, then zucchini and final layer of sauce. Sprinkle with mozzarella style cheese and 1 tbs of oregano. Bake, uncovered, for 1 hour and 15 minutes. 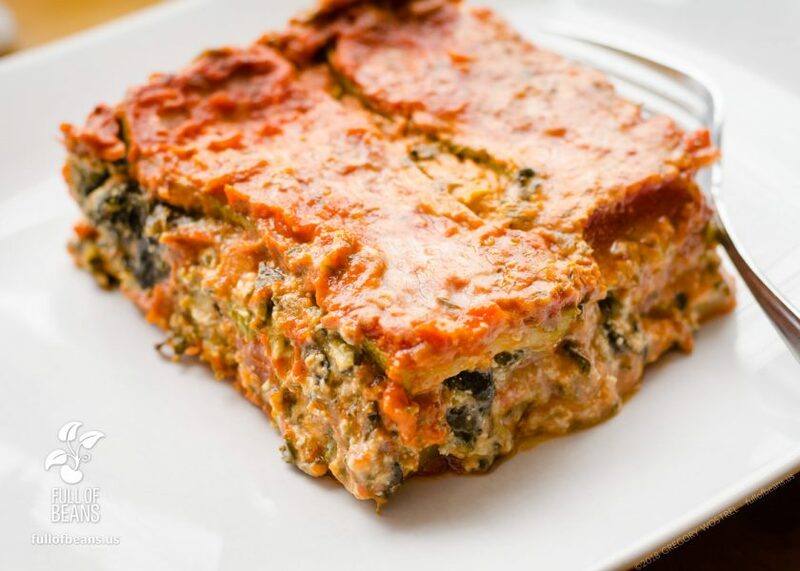 For a more traditional lasagna that is still vegan, simply substitute dry lasagna noodles for the zucchini and be sure to add the liquid with the thawed spinach. (if you use brown rice pasta – like Tinkyada brand – it is still gluten free). Remember to cover while baking and uncover to cool. This was my original recipe and I modified it to use up the zucchini. I have served it for years to non vegans and it is always a hit. The fact that you don’t have to cook the noodles first makes it quick to put together. Fat Content: if you are concerned about the fat content because of the cashews, feel free to use less. I often will use 1 1/2 cups of cashews and/or omit the vegan mozzarella. It’s a flexible recipe and you can adjust it freely to suit your tastes. The full recipe is an attempt to make an equivalent experience to a cheesy traditional lasagne and the full recipe has just over 11g fat per serving (1/12 of the recipe). Thank you for your loely comment on my blog! This lasagne looks absolutely delicious and gluten free to? oh my goodness! Yes! It is totally gluten free and soon yummy. You really have to try it. Georgia even included the recipe for the “ricotta” so you can make the whole thing at home. Thanks for stopping by our blog. We are also on Instagram and YouTube. Please check us out there, too. Hi Leslie, I assume you mean ones that you buy in the store, right? Georgia makes a lot of ours (Mozzarella and ricotta style), to be honest. But we do occasionally purchase the Daiya brand cheese. Their mozzarella shreds work fairly well used lightly on the top of a pizza or lasagne – but we are not huge fans. We just discovered the Go Veggie brand and have liked the ones that we tried. https://www.goveggiefoods.com/vegan/ If you are looking for cream cheese and sour cream type stuff Tofutti makes excellent products. Just wondering if you’re aware that GoVeggie cheese has dairy (casein) in it. They informed me 5 years ago they were looking at getting it out of their product but still haven’t done so. Just a heads up in case it matters to you. Thanks for your message. You’re right about the fact that they have items with casein. But, actually, they have a whole line of vegan products. Take a look at this page: goveggiefoods.com/products. Its a pretty good line up, but it sure would be nice if they would just go all vegan. We have used their products a number of times, but we usually use Daiya brand for the lasagna (and anything else, too). My favorite mozzarella style Cheese is Parmela Creamery aged nutcheese. I find it at Whole Foods. Hmmm, we haven’t seen that one, yet. But, then again, it’s been a while since our last visit to Whole Foods since the nearest one is about an hour away. Definitely making a note of this for the next visit. Thanks! I’m fairly new to veganism. I was skeptical about how this would taste. I made it for the first time last night and it turned out great! I’m very impressed and pleasantly surprised! I just worry about the fat content with the vegan cheese and cashews. Hi Katherine, that’s great that you gave it a try and enjoyed it! Awesome! It is certainly a favorite for us and family. Certainly the fat content is something to consider. Georgia often uses less of the cashews, but was directing the recipe toward folks who were looking for that cheesy lasagne experience. She often uses less (like 1 1/2 cups) and won’t even use the vegan mozzarella if we don’t have any. But, even the full recipe isn’t too heavy per serving. We get 12 generous servings from that recipe and it works out to approximately 11.5g of fat (none of it saturated!) per serving. Yes, it’s probably one of the more calorie dense meals we have and likely the fattiest. But it can be adjusted to fit your needs and tastes. Try it with have the cashew cream and none of the vegan mozzarella. It will still taste great and be much lower in fat. Please let us know if you try it again. I cannot eat most vegan cheeses due to yeast &/or sugar….do you think this would come out alright if I didn’t use the “mozzarella” & removed the yeast from the cashew ricotta? I love love love lasagna, but haven’t been able to eat it in forever. Nutritional yeast is not the same as yeast you put in your baking. Ì’m on the Candida diet which prohibits sugar, dairy, yeast . . . But specifically allows Bragg”s Nutritional Yeast Seasoning. That is the ingredient that gives the cheesy taste! This looks amazing. I just made an eggplant ragout yesterday, and I have gluten free lasagna noodles (if to be found!) on my grocery list, but I’m now changing that to extra zucchini, and going to soak my cashews. Before I make this I want to make sure it calls for two tablespoons oregano? Do the cashews need to soak? I plan on making this for dinner and am impatient with soaking nuts. 🙂 I have a Vitamix, so I’ve never had an issue with texture. Is there another reason they’d need to be soaked? Hi Angela, so glad that you are going to give this dish a try! Thanks so much! I did make it for dinner without soaking. The texture was very creamy. It did, however, take some work on the part of the Vitamix. 🙂 It was a good dish! I think next time I’ll add lasagna noodles in addition to the zucchini. It wasn’t hearty enough for my husband, who ate half the dish in one sitting! It’s heartier, still vegan, and also still gluten-free. The tinkyada brand noodles are the best, we think, by the way. Hello Aude Seynt Martin, it’s probably appropriate for 8 servings, depends on how hungry people are. We often have it for 5 adults and there are leftovers. As for the cheese, Georgia has a mozzarella style that she makes sometimes (still perfecting it) but also often uses Daiya brand mozarella shreds which work very well for this dish. If you give it a try, please let us know how it works out! Hi! I made this dish twice now and had to send everyone who ate it your recipe! The only problem I’m having is that it’s very goopy! I followed your recipe exactly AND I even rung out the spinach after it thawed. Is there a trick I’m missing? It’s delicious either way. Nia, I am so glad you like the recipe! I understand that it is pretty wet when you are using zucchini instead of noodles. Because they absorb a lot of the extra moisture, I only cover it while baking if I use noodles. Otherwise, I leave it uncovered to get some of that liquid to evaporate while cooking. Letting it stand for at least 15 minutes after it comes out seems to help too. Another option is to salt the zucchini, and pat it dry as it weeps out some of the liquid. But that hardly seems worth the hassle to me and may not make much difference. Loved this recipe, but definitely a little watery! I saw in some comments that you suggested to cook the recipe uncovered to help with this problem, yet in the directions it specifically says to cover it with foil.. Anywho! Just a thought for people who are making this in the future! Thanks for the great recipe! I made this last week for a dinner party and everyone LOVED it. Thanks so much for the recipe. I was wondering what your advice would be for making it ahead and storing it in the freezer. Have you ever done this? Do you have any instructions on cooking it from frozen? That’s wonderful! Thanks for trying the lasagne and letting us know how it worked out. You know we have never tried it frozen with the zucchini, but have with rice noodles. But I think it would probably be best to try cooking it, then sealing it, and freezing. Please let us know how it works out – it’s a great idea! I just made this and plan on freezing it with the raw zucchini. I’ll let you know how it is once I bake it! Oh, please do let us know. We hope you love it! Oh my… This looks so good! Hi Isabelle! This is Greg, I’m not sure about the answer to this one, so I’ll ask Georgia and one of us will get back to you asap. Thanks for visiting and for getting in touch. ? Isabelle, you can substitute 1lb of ricotta for the cashew cream and optionally add 1c of mozzarella. So glad that you are going to try it – please let us know what you think! ? Hello, I was wondering if this could be prepared the night before and baked the next day? I’m planning on making it with the Gluten free lasagna. Any suggestions? Thank you!!! Hi Andrea, we have done it with rice pasta and it was fine. It will probably be just fine with the zucchini. Please let us know how it goes! ? So sorry about the nut allergies, that must be a struggle some days. We haven’t tried the ricotta with anything other than the cashews, but perhaps we should do some work to develop a nut-free version. In the meantime, however, you want to have some lasagne! If you are OK with some experimentation you could substitute tofu for the cashews (press some firm tofu), increase the nutritional yeast, and maybe 2 tsp of agave syrup (since cashews have a sweetness to them). Understand that we have not tried this, it’s just where we would start the process ourselves. But you have inspired us to give it a try. Sorry this is so last minute because I was planning on making it for Easter dinner.. But I was scanning the recipe over and saw that you said you soaked the cashews for 2 hours. Is it going to be a problem if I use cashews that have been soaking overnight? Thank you! No problem at all! Delighted that you are including this in your Easter menu. Have a wonderful day! I was wondering if there were any alternatives I could use instead of cashews that won’t effect the flavor and texture of the ricotta very much! I’m dying to make this recipe for my friend, but she has a cashew allergy! She’s not allergic to anything else if that helps! Thank you! Thanks for being in touch. We have always made it with the cashew cream “ricotta” but we have been asked several times recently about an alternative for those struggling with nut allergies. We are working on a solution and will add it to the recipe as soon as we have it “just right”. (Please consider subscribing so that you will know when we have updated the recipe). We made a suggestion to an earlier poster with the same question which you can try But we have not tried it ourselves yet. Look back in the comments for it. I made this last week for some vegan friends of mine who had just had a baby. They raved about it so much that I ended up making myself one 🙂 Delicious! I’ve made lasagna with zucchini before but never the cashew cheese and was pleasantly surprised. Thanks for sharing this recipe. So glad that you and your friends liked it so much. That was really sweet to make it for them. Thanks for trying it, and for coming back to let us know what you thought. We would love to hear from you again if you try other recipes from the site! For the “ricotta” is the yeast necessary? I can’t use yeast. Thanks! Thank you for being in touch. As a matter of fact, we have been asked this before. We suggest just giving it a try without the nutritional yeast – it’s main purpose in that recipe is adding a certain “cheesy” flavor. It should all work, just with a slightly different flavor. Please let us know how comes out! Thanks for checking out our site! Thank you so much for trying the recipe and taking the time to respond. I’m so happy it was a hit with your family! 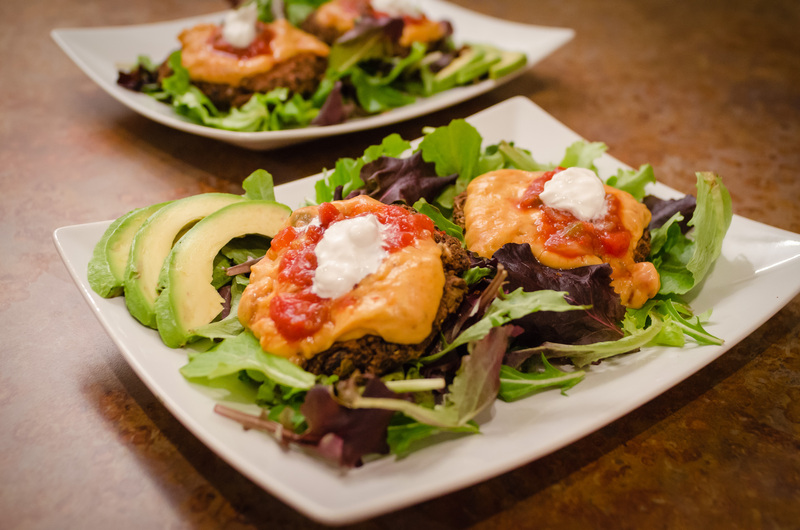 My goal is always to create easy family dishes that are delicious and nutrient dense. This is one of my favorites for family gatherings and entertaining for vegans and non vegans. It is also a great way to show how easy and affordable plant based foods can be without sacrificing any flavor or enjoyment. Making this recipe for dinner tonight, and I’m going to try both Tinkyada brown rice lasagne noodles (the brand you suggested) and zucchini noodles. Your recipe note stated to use *dry* Tinkyada noodles in place of some of the zucchini – I just want to make sure that I’m not supposed to cook them first (the box doesn’t say “no boil” and just has cooking instructions). Any assistance would be greatly appreciated, thanks! Hi Keri, sorry it took a little bit to get back to you. You can use dry noodles, just be sure to cover and seal the pan with foil before cooking. That keeps the moisture in and cooks the noodles. Let us know how it works out for you! Thank you for getting back to me! I ended up using the dry noodles for a couple of layers and zucchini for a couple of layers, and I must say this lasagna is the best I’ve ever eaten! Perfect moisture and flavour – way better than any restaurant lasagna, even the non-vegan cheese-smothered versions! Thanks again! Love lasagne and hate to eat wheat and dairy. Definitely going to try this, looks amazing! Going to skip the mozzarella too as I don’t normally like processed vegan cheese. Thanks for the comment and we are excited that you are going to try it. We hope you love it! Please let us know how it turns out! Amazing and delicious! Thank you so much for this recipe. My vegan husband can hardly believe there is no dairy. Any place that I can find the nutation all info? So happy that you liked it and that it was a hit with your husband! 🙂 Thanks for letting us know. We don’t have nutritional information on that recipe (or any of our;s as a matter of fact). We could work that out – do you think it would be a valuable feature for the blog? I rarely ever comment…but this one, i had too!! Amazing….made it with just the vegan ricotta ( which willnow be my go to for this!) No mozzarella, and used a no boil lentil lasagne noodle. Huge hit all around!! Thanks…. Isn’t that vegan ricotta/cashew cream just the best? We’re delighted that the lasagna was a hit, and we use gluten-free rice noodles every now and then ourselves. It’s an excellent option. By the way, where did you get the lentil noodles? Those sound interesting. This was so flavorful! I am greatful to have this plant-based dish as a substitute for one of my favorite comfort foods. Made this tonight- I precooked the zucchini a little to eliminate the water and added fresh parsley and more Daiya to the “ricotta.” It was delicious! Even the non-vegan husband approved! Thanks for the delicious recipe. I made your recipe today and think it is incredibly delicious. Both my husband and I loved it. The cashew ricotta is fabulous. I made whole wheat pasta to go with it. Think next time I will cook a few lasagna noodles and just serve your lasagna on top. We’re so glad that you and your husband enjoyed the lasagna! Thanks for taking the time to come back and let us know – comments from readers mean a lot to us. This one of my most made and most favorite meals! I have given it to skeptical meat-loving guests who then went back for seconds. Awesome every time. This was AMAZING. 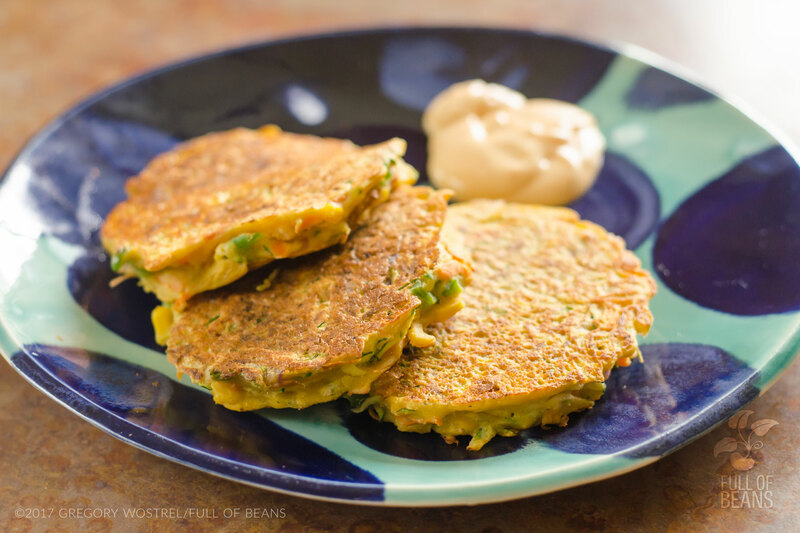 We just recently transitioned to a plant-based diet and I have been trying recipes galore – this one is my favorite so far! We actually used noodles instead of the zucchini this time, to keep it as close to our old diet as possible. The “ricotta” texture was amazingly similar once cooked – my husband even asked if I thought our friends and family would notice if we didn’t tell them! Keep the great recipes coming! We often make this recipe with noodles (Tinkyada rice noodles are particularly nice – if you are GF), too. Zucchini when its everywhere in the Summer and nice and fresh. We have fooled people many times. Once we had a big cheese snob friend over and she kept asking what the cheese was. I wouldn’t tell her until we were done but she was sure I had used fontina in it. Thanks for the recipee! In the process of making it right now and Im wondering, have you tried freezing this? Either before or after baking? No, we have never tried freezing it. But I’d try it after, not too sure about before cooking. If you are thinking about making dishes ahead of time so they are ready during the week, you can make this a day ahead and just leave it in the fridge. Made this tonight for mu husban. He loved it. He said that it was the best lasagna that he had ever eaten. Oh, thats wonderful, thanks for letting us know. It makes me smile every time I hear from someone who has made it. This was so incredibly good!!! I did it without the daiya cheese and honestly it didn’t even need it. It tasted better than traditional lasagna! It does make a lot though for one or two people so I am wonder can this be frozen? It is a big dish of lasagna – really intended for a family plus leftovers. To be honest, we have never tried freezing it after cooking. Its never around long enough, lol. It does keep just fine in the fridge for days and days as long as its in a container that is well sealed (so it doesn’t dry out). But it’s probably going to be fine freezing after cooking – give it a try! I think this is probably my first time ever taking the time to comment on a recipe. This was incredible. Yay! Your comment made our day. Thanks! Were so happy you enjoyed it. Thank you SO MUCH for letting us know. Nut allergies can be such a huge struggle and we’re glad you found something that allows you to continue enjoying the lasagna. Now, are you substituting the tofu 1:1 for the cashews? Please let us know (comment or via the contact form on the site). We’ll add a note to the recipe and credit you. I have made this for my family two times in two weeks and my husband (who is usually a critic on cashews subbed for cheese dishes) and he devoured two plates! It is soooo good and hits the “lasagna spot” without any meat, cheese, or pasta! My non-vegan friends demanded the recipe. This is wonderful – thanks for letting us know! It means so much to us to hear from people. I’m wondering about whether or not to cover the dish if I use a combination of zucchini and no-boil noodles? I was also thinking of using both zucchini and noodles for each layer. I know the zucchini needs to be uncovered to evaporate some water, but the noodles should be covered. What would you recommend? Thanks! SO sorry that it has taken such a long time for us to respond. We’ve been in the middle of buying a new house, doing some repairs, packing, moving, unpacking etc. Kind of a lot going on and we’re a little behind blog-related tasks. That being said, we’re happy that you are giving the lasagna a try. Its a great idea to mix the zucchini and pasta. Sounds like your best bet is to just go uncovered and just take a look at it mid-way to be sure it doesn’t dry out. Please let us know how it works out, whether you have already given it a shot or if you try it. Made with zucchini and with the lasagna noodles. Both were terrific. We were a little hesitant with the noodle variation because the rest of the recipe world calls for cooking the noodles first. We followed your recipe and loved it. PS: Another dish from my pre-vegan days I am missing is eggplant parmesan. Have you tried it? Thanks, also, for the challenge. I’ll get to work on it.